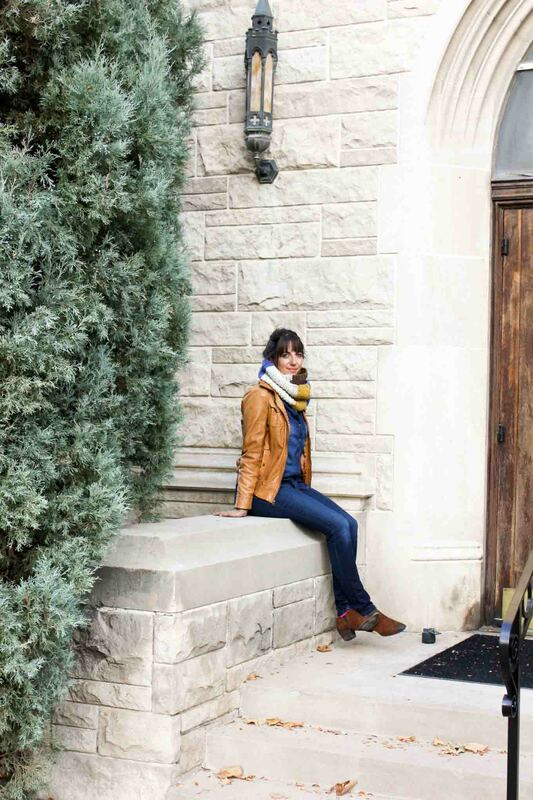 This easy, modern cowl is going to become your go-to accessory for fall and winter! 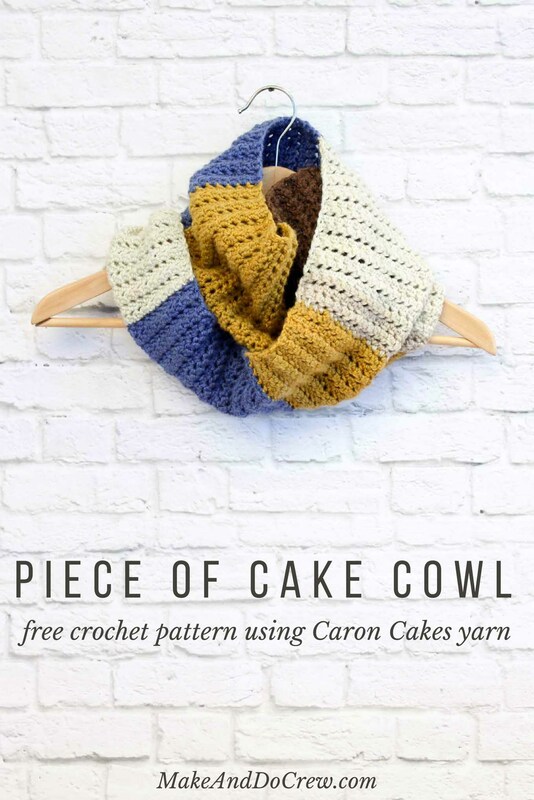 Plus, this Caron Cakes Yarn free crochet pattern is simple to make even if you’re not an experienced pattern-reader. As always, the free pattern is below, or you can purchase an handy ad-free, printable PDF for $2.50 here. How’s your neck doing today? Could it use a hug? 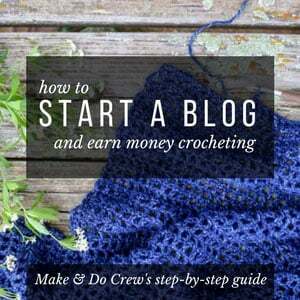 Well, you’re in luck then because I’d like to show you how to quickly whip up a little diddy that wont want to take off until April. 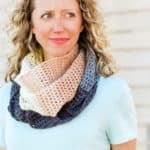 To me, this cowl is the perfect combination of a timeless scarf style with detailed, elegant (and seriously simple to learn) stitch pattern in modern and stylish colors. Thanks for that, Caron Cakes. Choosing colors myself is SCARY. Aren’t these colors just great together? If you haven’t yet tried Caron Cakes yarn (available exclusively from Michael’s), you should at least allow yourself the chance to peruse the color choices and dream of which you’d choose. And Michael’s just started offering Caron Cakes yarn online in addition to in-store, so now no one has to miss out! 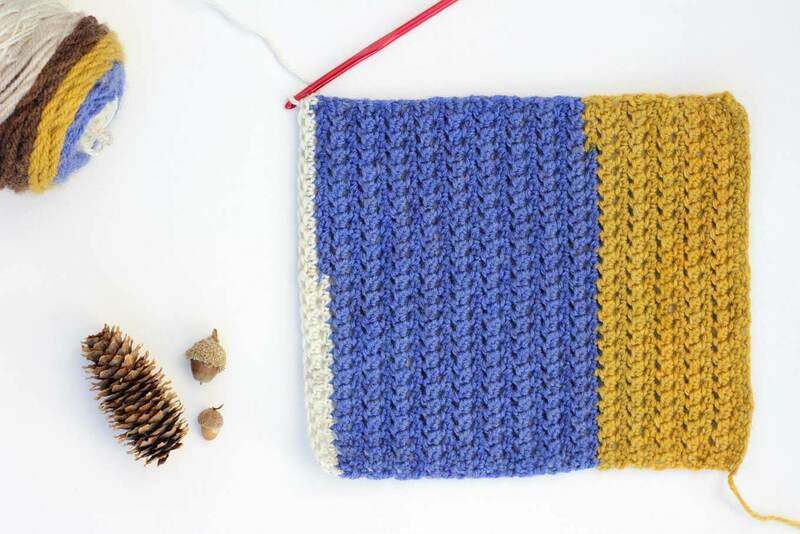 I love thinking about the people closest to me and assigning them each a Caron Cakes color palette. 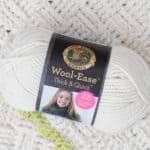 When I saw this “Royal Icing” color, I knew it would be total heart eyes on my sister, Mich.
Mich has been working on learning new crochet stitches lately (remember this amazing chunky afghan she whipped up? ), so I bought her a skein of Caron Cakes yarn, gave her my “H” hook and this is what she came up with. Isn’t she a rockstar?! 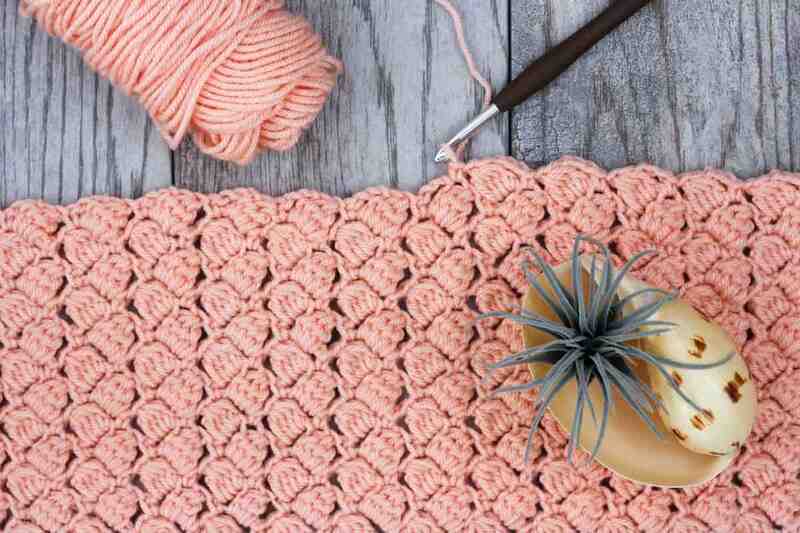 This Caron Cakes yarn free crochet pattern consists of learning just one unusual stitch called the “Odd Forked Cluster” stitch, but even if you haven’t read a lot of patterns, I’ve got you covered with a chart that should help explain things. 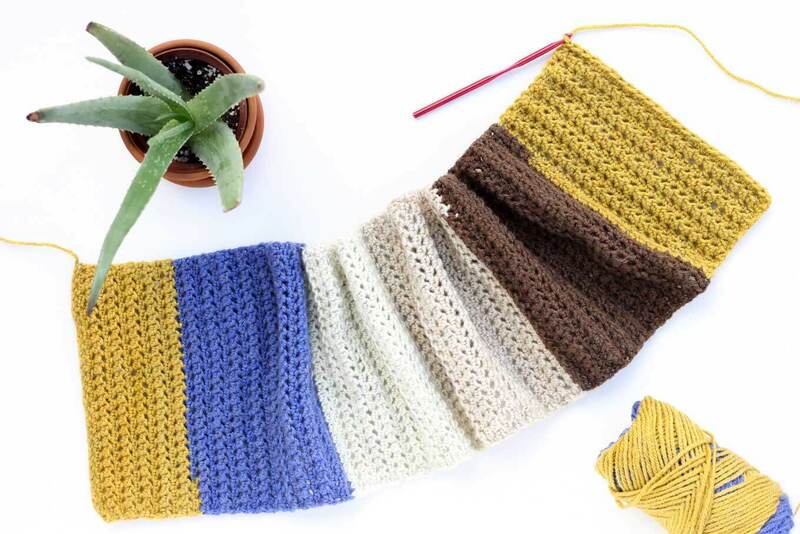 And if you end up falling in love with this yarn like I have, you might want to make my “Desert Winds” triangle scarf, a free crochet pattern that also uses Caron Cakes yarn. Purchase the convenient ad-free, printable PDF for $2.50 here. 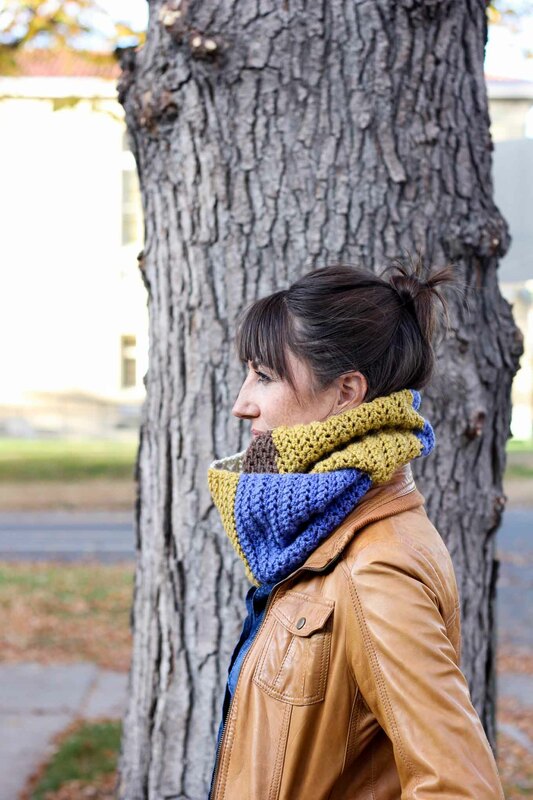 Add the “Piece of Cake Cowl” to your Ravelry favorites here. Not critical for this pattern. 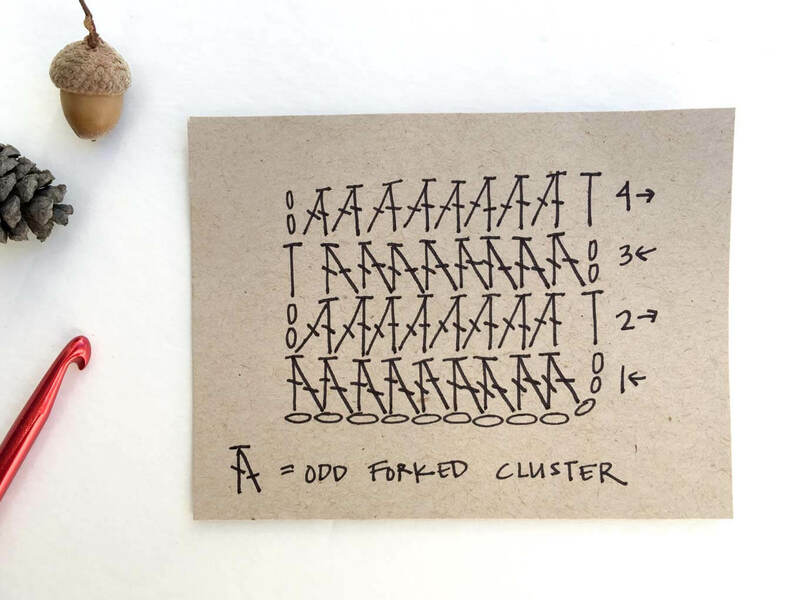 OFC (Odd Forked Cluster) – yo, insert hook into ch or st as indicated, yo, draw loop through, yo, draw through 2 loops, insert hook in next ch or st, yo, draw loop through, yo, draw through all 3 loops on hook. 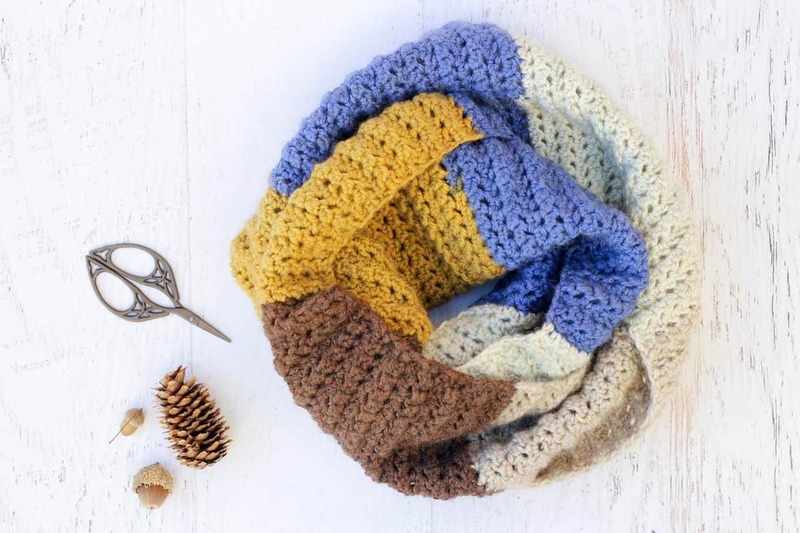 This scarf is worked as a long rectangle and then sewn together into a loop. Row 1: Sk 2ch (counts as 1hdc), 1 OFC inserting hook first into third and then fourth ch from hook, *1 OFC inserting hook first into same ch as previous OFC then into next ch; rep from * until 1ch remains, 1 hdc in last ch; turn. Row 2 : Ch 2 (counts as 1hdc), 1 OFC inserting hook first into first st and then next st, *1 OFC inserting hook first into same st as previous OFC then into next st; rep from * ending with 1 hdc in top of tch; turn. Repeat Row 2 for approximately 54” or until about 3’ of yarn remains in your skein. Fasten off. 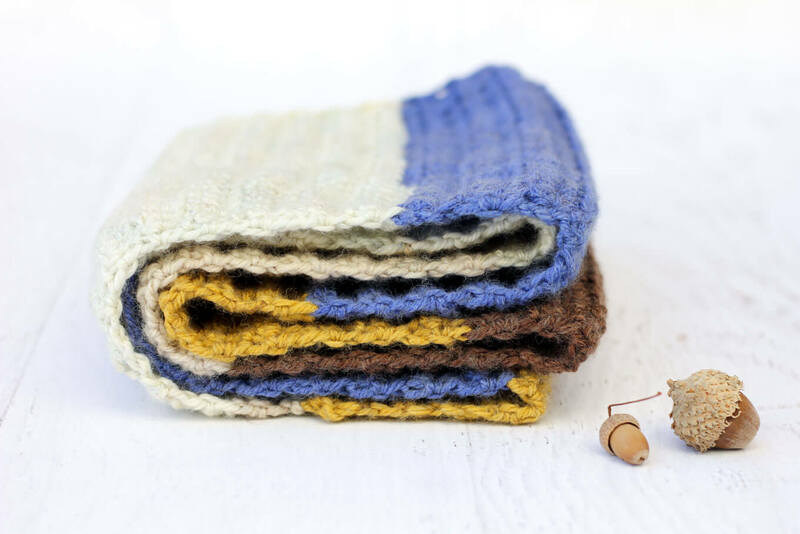 Use a mattress stitch to sew the rectangle ends together, taking care to line up the stitches one for one. Work in the outside loop of each stitch. Reference this helpful tutorial for photos. Pop that cowl over your head and don’t take it off until bathing suit season! 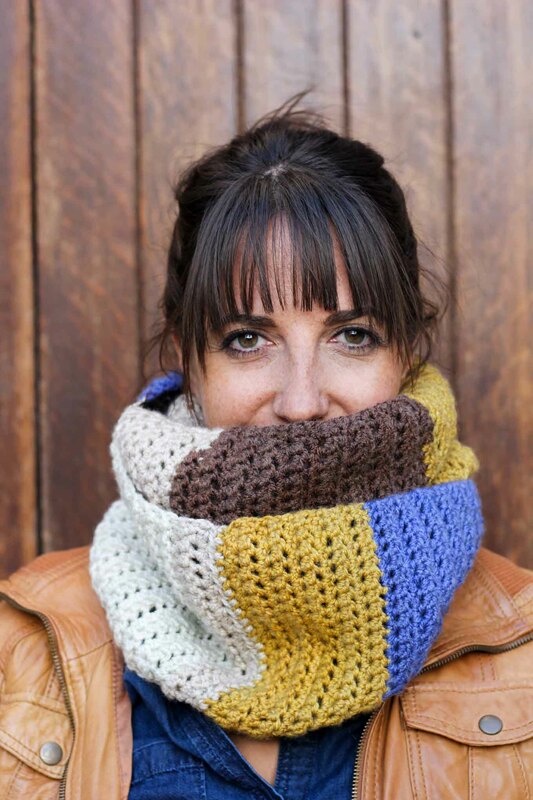 Great work will u make a video for the Caron cakes cowl?? I am following the instructions and the width with the 5mm is only 6″. And doesn’t lie flat!! Sometimes it can take a several rows to begin to lie flat. Once you sew it into a loop, it shouldn’t be a problem at all. If you’re finding it too narrow, you could move up a hook size or two. Hi I am trying to complete this project with the wool caron cakes and 5 mm hook when I start the project the width is only 6 inches??? Should I be using a larger hook or am I doing something else wrong?? This is a very cute scarf design, plus I get to use my neglected 5.00 mm crochet hooks. Thank you for sharing, and I look forward to the video if you make one. Great patterns. Thank you. 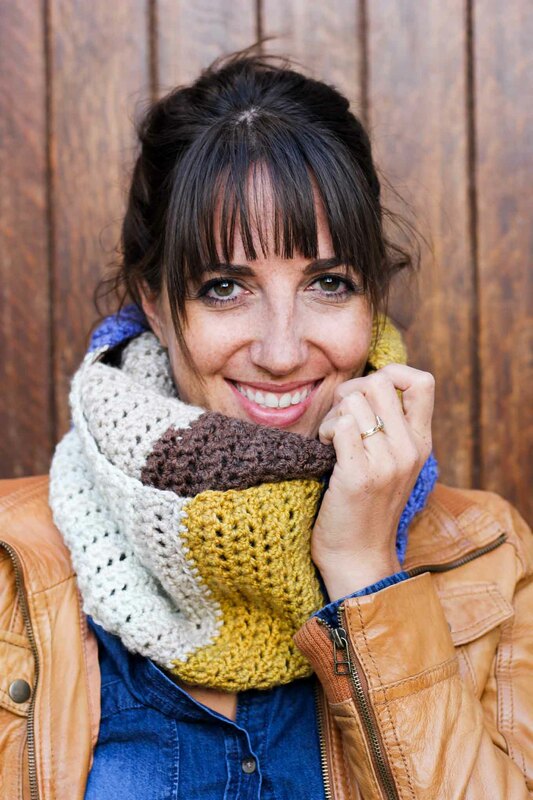 I love the Piece of Cake Cowl! 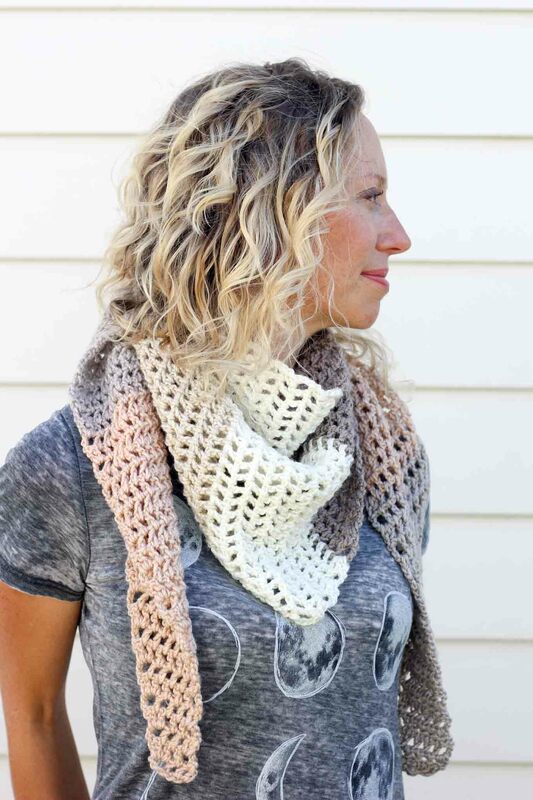 Also love that there’s a link from there to the Desert Winds Triangle Shawl; also a 1-cake Caron Cake project! What an awesome win-win! ??? I hope you enjoy the patterns! 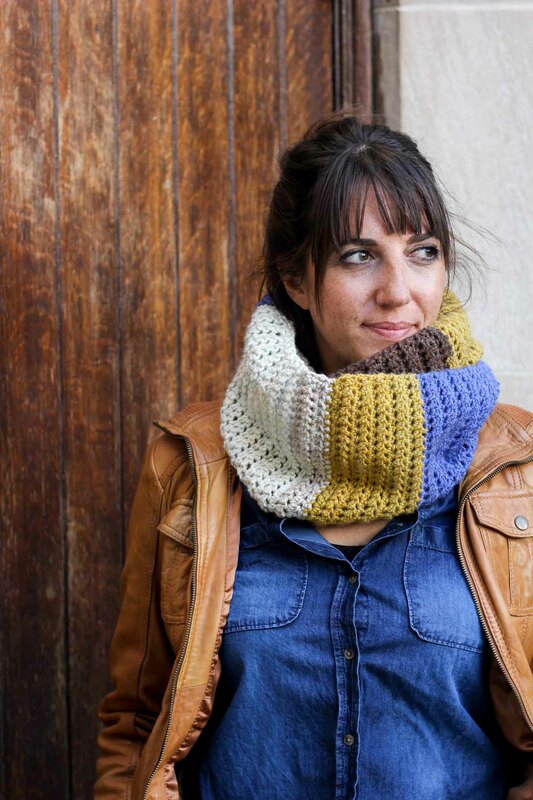 Lovely easy cowl, I love the colours you’ve used Jess. Thanks, Heather! It’s all the yarn honestly! I love how Caron Cakes take the stress out of choosing colors because for me it is indeed very stressful! I love this! A video would be very helpful though! My stitches seem to be decreasing! How many st should I have in each row? I believe you should have 24 in each row. I’m sorry, I don’t have the scarf anymore so I can’t actually count. There should be a consistent number throughout though. Are you definitely doing the last hdc in the turning chain at the end of the row? 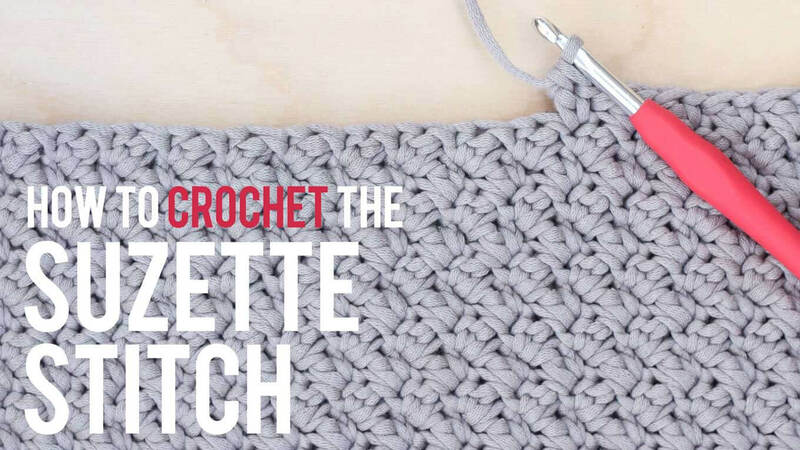 Without that, you might be accidentally decreasing by one stitch per row. This cowl was a joy to make! I especially loved the odd forked cluster stitch. Would you mind sharing the multiples for that stitch? I’m toying with the idea of using it for a lapghan. Thank you! Hi, I love this scarf and I had the yarn so I was able to start it as soon as I found the pattern. However, I only come up with 22 stitches and I noticed in one of your replies to someone else you thought it should be 24. Also, this is curling up. Could you please take a look at the pattern and tell me how many stitch O should have and is it normal for this to curl? Thank you for your time.